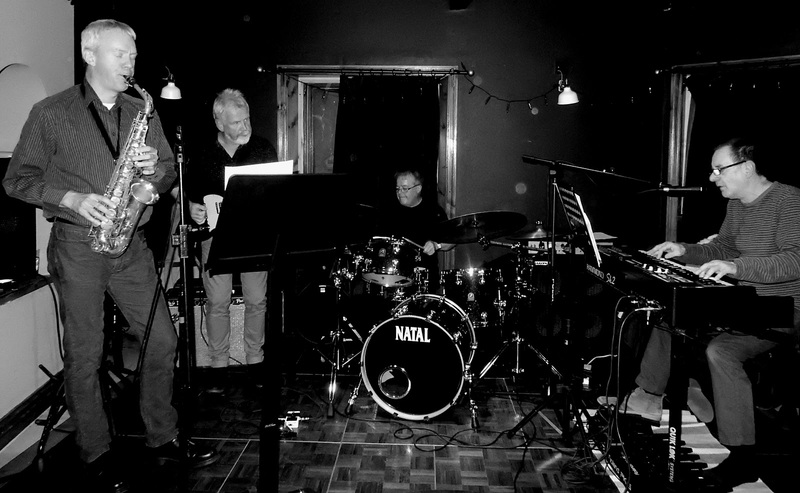 Gerry Richardson (Hammond SK2/vcl); Garry Linsley (alt); Rod Sinclair (gtr); Paul Smith (dms). This was an unusual gig, no ipads or tablets just good old fashioned ms paper and ears. Good to hear Garry Linsley again, it had been awhile, he still blows some of the most blistering alto around without losing the melodic touch, Likewise Rod Sinclair, on Telecaster tonight, fusing jazz, rock and blues licks into a funky, soulful blend. Paul Smith drove the train (Trane?) along powerhouse style slotting in solos and breaks dynamically. The build up to his solo in African Sunset was masterly. As for Gerry, well, he is surely at the top of his game. Much has been said about being the best Hammond operator north of Watford Gap. I'd have added east of Detroit to that too. The original All About McGriff proved that. He uses the bass pedals as good as anyone and better than most. To me, an organist without a bass pedal board is like a violinist using only 3 strings. Material included Mose Allison's Everybody's Cryin' Mercy; Steve Kuhn's Chicken Feathers (that was one chicken that got well and truly plucked! ); The Crusaders' Soul Shadows; a Billy Preston number the name of which I didn't catch; I Put a Spell on You and Joe Zawinul's Mercy, Mercy, Mercy. There was more but the Metro waits for no one so it was with great reluctance that I departed. Earlier, my intention had been to kickstart the evening at Pizza Express in Dean St. (Newcastle) but, confronted with steep stairs to the jazz room, I chickened out knowing that there were more stairs facing me at the Jazz Café. My loss as I was really looking forward to hearing Matt Jacobs again and showing support for a new venue. Maybe next time. At least there's a lift at The Globe for tonight's Jazz Coop gig by Alter Ego. There was indeed more. Freddie King's The Stumble closed the show. For an encore, Jimmy Smith took us Back to the Chicken Shack.